Picture this: A twisting, turning, terrifyingly narrow canyon looms in front of you. You’re shooting toward it in a large red boat, going more than 80 kph. And, once you pass through the jagged canyon walls, the boat pulls a 360-degree turn in the middle of the river. No, it’s not a scene out of an action flick — this is just another ride on the Shotover Jet. For the past 40 years, Queenstown’s Shotover Jet has been thrilling millions of adventure seekers from around the globe. 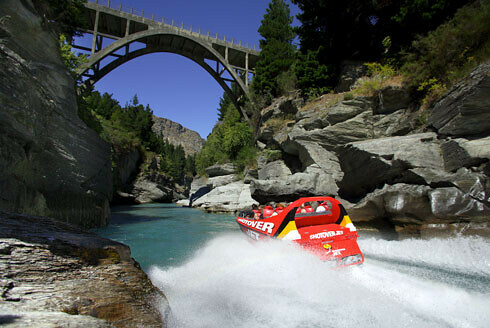 The fleet’s big red jetboats zip up and down the Shotover River, skimming past high canyon walls, taking hair-pin turns sideways, and pulling 360-degree turns in just inches of water. It’s just as exhilarating — and as fun — as it sounds. Jetboating is another one of the crazy adventure sports that was dreamed up by a New Zealander. 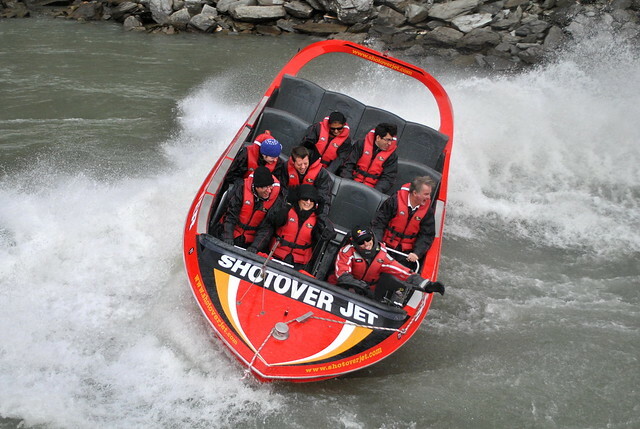 The first jetboat was built in the mid-1950s, and, by 1970, the Shotover Jet was operating as one of Queenstown’s first commercial adventure activities. Since then, it has grown into one of New Zealand’s most popular attractions. Jetboats operate differently than regular motor boats, with water intake systems similar to what you find on jet skis. The first jetboat was designed without any sort of propellers so that it could navigate the shallow rivers New Zealand is known for. 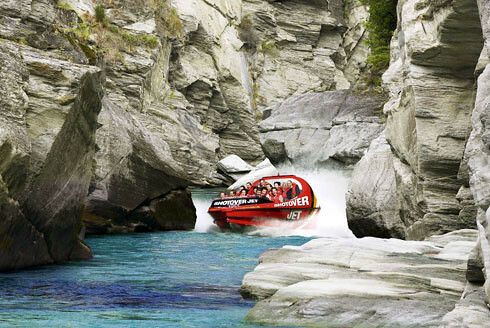 The massive Shotover Jet boats can travel as fast as 85 kph in just 10 centimeters of water. And, without propellers, the boats are able to perform their signature 360-degree spins. The jetboat in mid-spin. That's me in the blue hat, getting a faceful of water. 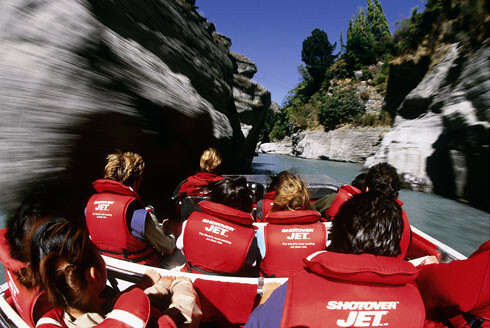 The Shotover Jet is one of 4 jetboating options operating out of or near Queenstown — the others being the Kawarau Jet, the Skipper’s Canyon Jet, and the Dart River Jet. But the Shotover Jet is perhaps the most popular, because it is the only company with permission to operate in the awe-inspiring Shotover River canyons. A ride on the Shotover Jet begins with a short bus ride from downtown Queenstown out to the boat dock along the shore of the Shotover River. You place your belongings in a locker, and are given an oversized raincoat and life vest to put on before having a photo snapped in front of the river. My friend Jeremy and I cheesing hard. Then you climb into the boat with up to 13 others. Before you know it, you’re careening up the river, headed into the canyon. Probably screaming you head off. Your driver — who has gone through ridiculously extensive training to pilot the big red boat — will sidle up to the canyon walls, send the boat skimming sideways around turns, and accelerate so fast it might take your breath away. And then comes the tell-tale sign: the driver raising one finger above his head and moving it in a circular motion — it’s time for a 360-degree turn. Hold on! This process will repeat a handful of times. You’ll cover a few miles on the river, and pass through the narrow canyon walls at least 4 times. You’ll bump over rough water, skim over sections of river where you can almost reach out and touch the bottom, and laugh with delight as the large boat spins around again and again. I’ve done plenty of water sports before — from tubing to water skiing to pulling flips off the high dive. But nothing can compare to the adrenaline rush that comes from jetboating. My most recent ride on the Shotover Jet came just last month, as I traveled around New Zealand’s South Island on my Blog4NZ trip. It was my second time on the big red boat, but it was just as exciting — and just as memorable — as the first. I brought a friend along, too — Jeremy of Travel Freak — and we had a blast yelling and laughing as our driver sped through the canyon and over rough bits of river. We were also blasted in the face with plenty of frigid water. By the time the ride was over (just under half an hour), our faces were about ready to fall off from the cold water and wind. Book your Shotover Jet tour here. 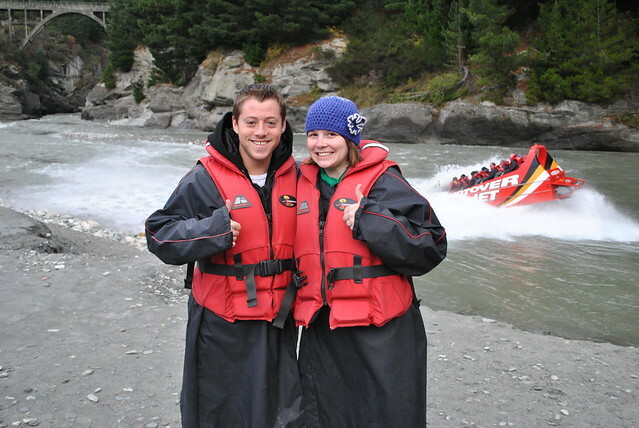 Are you considering a jetboat ride in New Zealand? I highly recommend it. But there are some things you should know before you climb into the boat. You'll probably get wet. They give you oversized raincoats for a reason. With the high speeds, frequent turns and variable river conditions, water is often sent flying over and into the jetboat. And it will probably be cold. This is also why it's best to leave all your valuables behind in a locker. There's nothing worse than a wet camera that isn't supposed to get wet. Leave the hat on shore. Don't wear anything — be it a hat or glasses — that might get blown off your head when the wind is whipping past. The boat will move FAST, and the guy sitting behind you doesn't really want your sunglasses attacking his face halfway through a 360-degree turn. Dress warm. Jetboat rides operate year-round, often in very chilly weather. It's likely to be cooler in the canyon, too, and even colder when you're zipping through it at more than 80 kph. While the handrail in front of your seat is heated, gloves aren't a bad idea. Sit on the driver's side. This may not be true of all drivers, but both times I've ridden on the Shotover Jet, those sitting on the driver's side of the boat seemed to get closer to the canyon walls than those of us on the other side. If you want your jetboat ride to be as thrilling as possible, sit on the left side of the boat. So would I recommend the Shotover Jet to visitors to Queenstown? Umm, hell yes. The Shotover Jet is the most expensive jetboat in Queenstown (with tickets costing $149 NZD), but I'd say it's totally worth it. Have you ever been jetboating? Tell me about it! If not, is it something you'd pay to do while traveling? Disclaimer: I received 2 complimentary passes for the Shotover Jet as part of my Blog4NZ prize package. But I've paid for it before, and I'd pay for it again. As always, all opinions are my own. All photos and videos (except the last one) provided by the Shotover Jet. The Shotover Jet was one of my favourite things to do in Queenstown. Though I went on it back in 2005 and remember it being a hell of a lot cheaper than that. Wow how prices increase over the years! Still, it’s definitely worth the money for the experience. It’s so much fun! But yes, pricey. In fact, it’s gone up $10 just in the last couple of years. When I went on it the first time in 2008, we paid $109, I think. But I still think it’s worth it. I mean, why travel all the way to NZ and then shun all the adventure sports it’s famous for, right?? A very cool experience indeed! And if you are considering jetboating, I would do the Shotover. There may be other cheaper options, but I really don’t think you’ll regret paying a little extra once you’re zipping through that canyon! Hahah that photo is pure cheese! Thanks so much for taking me along–I had a great time! Haha, pure cheese, indeed! Wonderful, glorious cheese. Lol. Thanks for coming with me, even though it was your third time! That looks like so much fun. I don’t know if I could do something like bungee jumping in New Zealand but I could definitely do this. Jetboating is a good compromise for someone who wants a little adrenaline coursing through their veins, but who doesn’t necessarily want to throw themselves off a bridge or out of a plane! It’s a lot of fun. Looks like fun! Seems like I’m going to have to try it when I’m there next. Yay for more adventure! You should definitely try it, Christina! And if you only hit up the North Island with your Blog4NZ prizes, there a jetboat in Taupo you could check out (the Huka Falls Jet). Awesome! And I know what you mean about it feeling like cheating to skip one of the islands. Even though all my prizes were on the South Island, I still spent a few days in Wellington and went up to the Kapiti Coast. I couldn’t visit NZ and not visit Welly! Looks like a blast. We should have done it when we were in Queenstown. We had free passes to it too, it was the second time back there in 6 weeks and the weather was terrible. We were sort of unmotivated so we sat in coffee shops and shopped instead. Now I’m kicking myself! And managed to take pictures while on board? I took video onboard (the very last video), but the photos were all provided by the Shotover Jet. It would have been really tough to get a good shot, with the boat going so fast and bumping around so much! Jetboating is SO much fun! Definitely a thrill ride worth trying. I don’t think you can do it in very many other places in the world – and certainly not through a canyon like the Shotover Canyon! Definitely add it to your NZ list. I love jet boating. My mum is actually a little addicted to them and had us go three times while we were in Queenstown last time! Three times? Wow, yeah that’s addiction! Haha. But it’s not difficult to understand – jetboating is so fun! This looks like so much fun! I would love this. We did a crazy fast zodiac ride in Hawaii one time and it was exhilarating too. Jetboating is probably similar to what you did in Hawaii – except that the kiwis take it to the extreme, and send you flying through narrow canyons! It’s a ton of fun. Love the Shotover Jet! I can’t believe how close they get to the canyon edges! I know! I mean, you could *literally* reach out and touch the canyon walls if you dared. It’s insane! I imagine it would be too dangerous to even be legal in the U.S. Lol. That would be the perfect word for it! As far as NZ adventure activities goes, it’s actually pretty tame. But jetboating is definitely a thrill fit for any adrenaline junkie! Haha, it IS awesome, Katrina! When you make it down to Queenstown, DEFINITELY give this a try! I got on one of these while in Queenstown and loved it! It`s such a thrilling experience.